In The Big Book of Beasts Yuval Zommer's wonderful illustrations bring to whimsical life some of the grizzliest, hairiest, bravest, wiliest, and most fearsome beasts in the animal kingdom. Brimming with interesting facts from beast consultant Barbara Taylor, this charming picture book is a beautiful way for parents to introduce young children to the animal world--and for older children to learn by themselves. In the first pages children learn that beasts are wild animals that can't be tamed and that they all defend themselves in different ways. 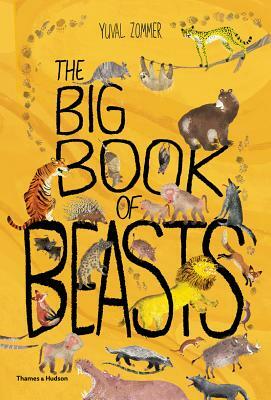 As the book continues young readers meet specific beasts, including armadillos, bears, tigers, and the Tasmanian devil. The Big Book of Beasts also approaches the world of beasts thematically, looking at mythical beasts, Ice Age beasts, beasts on your street, and how to save beasts in danger of extinction. The funny and conversational text, amazing facts, and glorious and quirky pictures will draw in young children over and over again.